Apple doesn’t allow parental control apps to see how long kids have spent using specific apps, however there is a feature built into Apple devices that gives you some information. To start off with it will only show you the amount of battery used by each app. Tap the Clock icon in the top right corner and you can see the amount of time spent on each app, in the foreground and background. 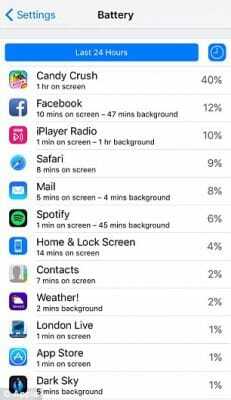 Apple doesn't allow parental control apps to see how long kids have spent using specific apps, however there is a feature built into Apple devices that gives you some information.